Our extra fancy friends over at YOOX are getting into the holiday spirit the only way they know how: with a spectacular Venetian dinner party. We were so honored to have been asked to join in on the festivities! YOOX used WIREWAX to create a five-part shoppable videos series, featuring their wonderfully eccentric and fashionable group of party-goers. This extraordinary holiday gift-guide is as interactive as it is eclectic; and you, the viewers, are invited to pull up a chair and get to know the other guests. Hope you're hungry for some serious style! While scrolling through the panoramic dining table, each set of guests - young, artsy, elegant, exuberant, and active - has their very own shoppable video. The Young Guests, starring Alessandra Mastronardi and Ivan Olita, was the first of the videos to be released. Watch the beautiful, young couple as they frolic around Venice leaving a trail of mischief in their wake. Like what you see? Let's be honest, of course you do! Shop the look by clicking on everything from their glam winter coats right down to their cool kicks. Each set of guests arrived at intervals throughout the last month and now that everyone is here, the party can get started! If "young" isn't necessarily your cup of tea, not to worry; Yooxmas is jam-packed with interactivity for everyone. Everything is shoppable, right down to the tableware in the panorama. 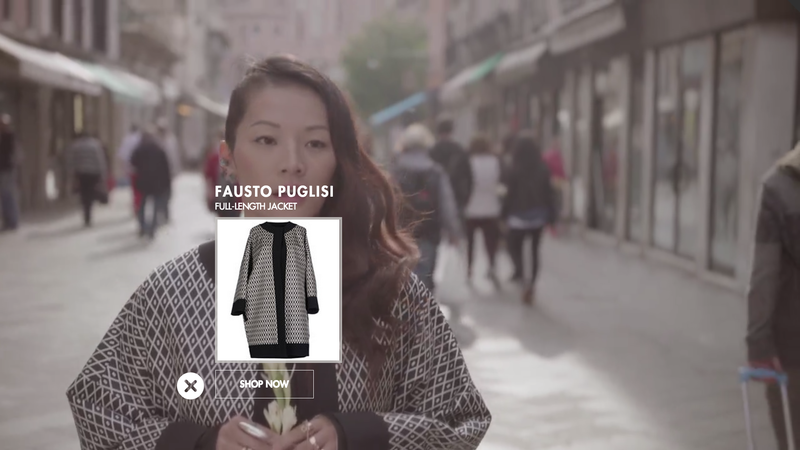 However, YOOX took this beyond shoppable and is using interactive video to brilliantly weave together a beautiful narrative surrounding the gift guide. Perhaps the artsy Lynn Yaeger, or the exuberant Tina Leung are more tailored to your liking? Each video shows not just what these guests were wearing before they arrived to dinner, but what they were doing; a glorious glimpse into their lives and how they're all connected to one another. YOOX caters to all varieties of personalities, and is encouraging their customers to dive into the sparkling stories that speak to them most. You can watch the videos and shop the gift guide HERE. The table is set, and style is served.